Think back to 1992; it was 17 August when ANDREW the first-named tropical cyclone of the season was generated from a tropical depression, which had activated about half-way through Hurricane Alley some 1,000 km to the southwest of the Cape Verde islands. Flash forward to the 2011 Atlantic hurricane season! It is Sunday 28 August and at the same time that IRENE, the first hurricane of the season now degraded to tropical storm strength, ravages the northeastern USA and eastern Canada with 100+ kph winds and huge amounts of rain, tropical storm JOSE had activated to the south of Bermuda. What does it all mean for us? Will 2011 be a record-breaking type season such as the one in 2005 or still an above-average-but-not-as-active, similar to the 1995 Atlantic hurricane season? NOAA’S Climate Prediction Center [ for more on NOAA’s 2011 Atlantic season prediction, go to: http://www.noaanews.noaa.gov/stories2011/20110519_atlantichurricaneoutlook.html ] estimated we will see as many as 18 named storms generating in the Atlantic basin in 2011, which means we are already 56% there with about 51% of the official 2011 season still left to go. Speaking strictly in statistical terms it would appear there is a a slightly higher than average chance that we may have at least a 1995-type season reaching the 18 total named storms predicted by NOAA for the 2011 Atlantic hurricane season. 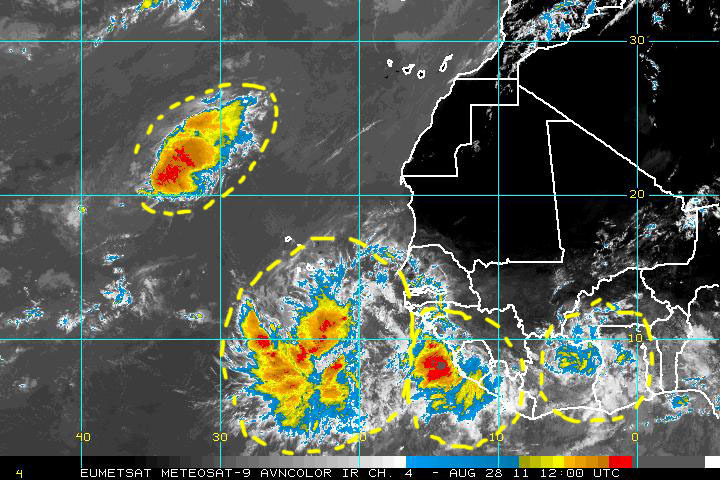 Looking toward the east we see a couple of larger tropical waves to the west and southwest of the Cape Verde islands, and also a couple of minor waves over equatorial Africa. However it is interesting to note that, at least for now, the amount of tropical activity we have seen over equatorial Africa over the past few weeks appears to have subsided considerably, and the same can be noted about the western ranges of the northern Indian ocean. for seeds of future tropical cyclone in any of the sub-basins at least for now. 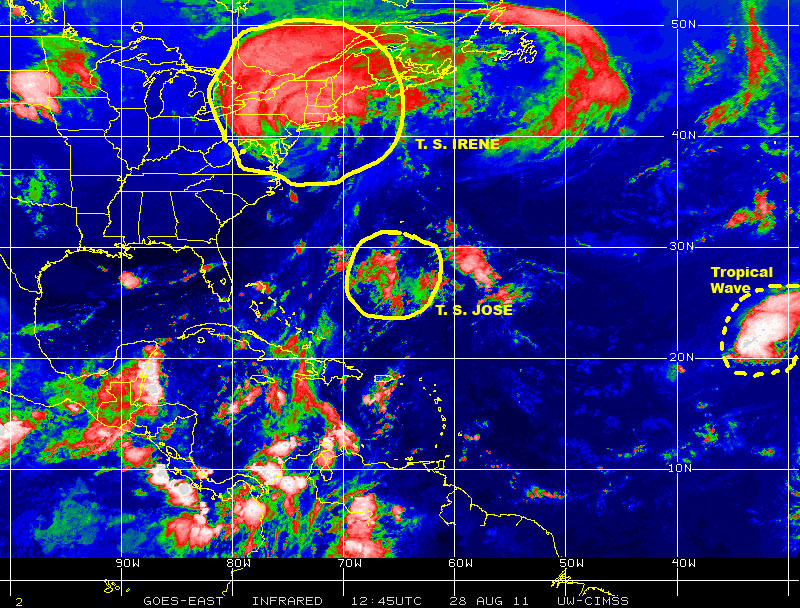 We will have to wait and see what weather patterns may evolve over the next few days, which may construct a favorable environment for potential tropical cyclone development anywhere in the Atlantic basin leading into the first days of September. Keeping in mind that September has historically been the most active month for cyclogenesis in the Atlantic basin, it is entirely possible we could see significant cyclonic activity over the next few weeks. We will have to wait and see. 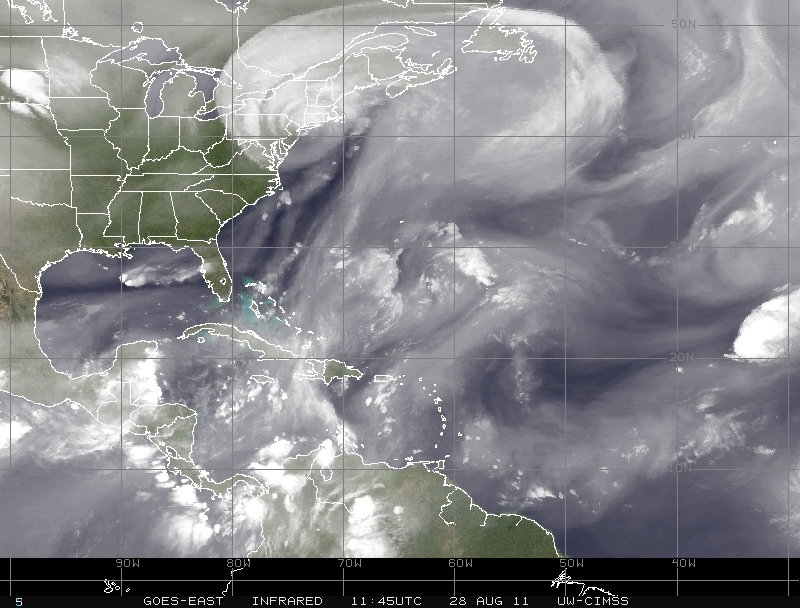 Tropical Storm IRENE: Here we Go Florida! 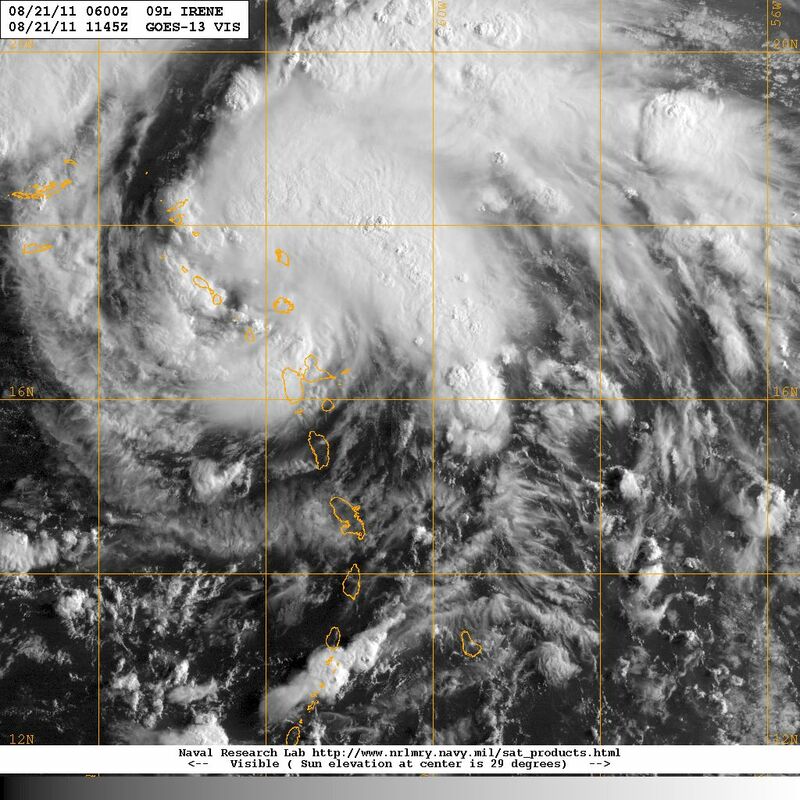 Now that Tropical Storm IRENE, the ninth-named tropical cyclone of the 2011 Atlantic hurricane season, has generated in the extreme eastern Caribbean the data-crunching by the prediction models is is busy following the path of the storm trying to determine where it might go and where it could be five days from now. These models used by the National Hurricane Center require continuous input from satellite observations, from surface observations made by oceangoing ships in or near the path of the storm, and also from observations and data captured by especially equipped airplanes, the so-called hurricane hunters, which fly through the cyclone in a zig-zag pattern at an altitude of 3,000 meters and others that flight around the perimeter of the storm at much higher altitudes. The end result of these model runs is not only the graphic representation of the projected storm track as a cone of uncertainty which is used by emergency management and civil protection authorities to issue alerts, watches and warnings for the public, but also information about sustained wind speeds, potential wind gusts, minimum central atmospheric pressure, amount of precipitation, potential for strengthening or weakening as the storm progresses. Over the years predictions by the National Hurricane Center based on these models, especially the projected three-day track, have improved considerably becoming more accurate over recent years. Despite this improvement in track prediction, the five-day forecast still carries a high degree of uncertainty, which is why the cone of uncertainty gets rounder and wider toward the end of any given five-day prediction. With respect to Tropical Storm IRENE the model runs have resulted in a track that has the tropical cyclone strengthening over the next 24-48 hours, perhaps even reaching hurricane strength as it approaches a predicted landfall in Hispaniola. 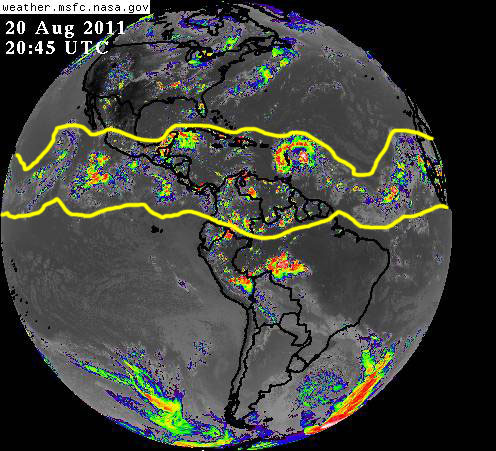 At this point an assessment of the coupled ocean-atmosphere environment around and ahead of the storm suggest it may survive its interaction with topography as it traverses over Haiti and Cuba to reorganize, and perhaps strengthen again to hurricane strength, over the Bahamas and Florida straits for another landfall somewhere in south Florida. Based f current projections Florida is a target for Tropical Storm IRENE, possibly as a hurricane by then, toward the end of this week. Because this projected impact on Florida is toward the end of the five-day track the degree of uncertainty as to the exact region of landfall, its intensity at the time, or whether there will be a land fall at all or not in South Florida, remains quite high. Such uncertainty notwithstanding, the prudent action for all South Florida interests is to monitor the progress of Tropical Storm IRENE closely over the next 2-3 days, be on the alert, make preparations and concentrate of ways to mitigate any potential impact if and when it takes place. In fact all interests around the Caribbean sub-basin, particularly along the eastern periphery of the Caribbean sea, and in the Bahamas and South Florida, will do well to pay close attention as IRENE evolves and moves over the next 24-72 hours. Composite full-disk satellite image of Earth's western hemisphere taken in the afternoon of 20 August 2011, showing the 'belt of tropical activity' circling the planet just north of the equator. Those of us who call South Florida home will do well to keep an eye on what happens with Tropical Storm IRENE over the next few days, especially when our region enters the three-day cone of uncertainty toward mid week. In the mean time Pay Attention! Be Prepared!! MITIGATE!!! UPDATE: Sunday 21 August 2011 at 6:30 p.m. Tropical storm IRENE has found a favorable environment and it has gotten better organized and strengthened during the day today. The most significant development with IRENE today is a slight shift of its track toward the north, which will bring it for a possible landfall in southwestern Puerto Rico and a more northerly track over Hispaniola and Cuba, and faster forward movement along its track. Should these changes hold the risk of landfall near the large urban area in southeast Florida increases, although the margin of error this far away is quite high, in the order of 320 – 400 kilometers either way. Following is the modified track as published by the Navy Research Laboratory, which when compared to the one posted earlier [above] shows what has been described.